My thank you page is not showing after clicking submission. What's showing up is create your own jotform. Would you please make my thank you form show please? The custom Thank You URL seems to be currently missing in your form settings. Please add it and then re-check the form. 1) I don't know how to create another link. I would like to use your thank you form without redirecting. Does you thank you work with redirecting? 2) If I have to create another link, I tried to do it and copied the new link and it still does not work. Please help make this simple. Make a simple thank you link so I can paste it. If you have to advertise your link at the bottom of the thank you form, please make it redirect so it does not go into my form. You are not required to configure the redirect. 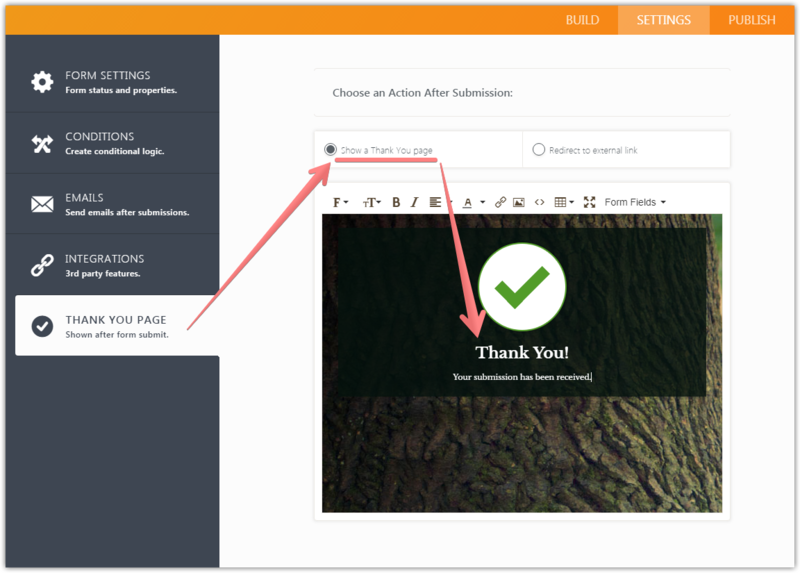 You can use the form's thank you page, just select the 'Show a Thank You page' option. You can also edit the content of the form's thank you page. The redirect is required if you would like to redirect user to a custom thank you page on your website.